Three people confront Hercules Poirot about a letter accusing them of murdering Barnabas Pandy. Out of the three, only a young woman named Annabel Treadway believes Poirot when he says he didn’t send the letters and doesn’t know Mr. Pandy. Miss Treadway tells Poirot that Pandy is her grandfather and he did recently die, but it was of natural causes. However, Poirot is now intrigued by the situation and with the help of his friend Inspector Edward Catchpool, he decides to dig further into Pandy’s death and the true author of the accusing letters. I am a big fan of Agatha Christie and her Poirot series has always been my favorite. I was thrilled when Sophie Hannah began writing new mysteries featuring the great Belgian detective and really enjoyed the first two of her Poirot novels. 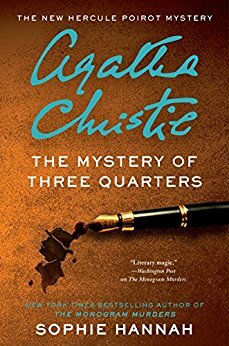 The Mystery of Three Quarters is good, but I didn’t enjoy it as much as the prior two books. This is mainly because of the supporting characters in the book. The actions of a few of the suspects, such as the absent-minded Hugo and the self-critical Annabel, become repetitive and tedious after a few chapters. There is much to like about the book, though. Obviously taking over an Agatha Christie character sets a high bar, but Sophie Hannah does an excellent job of capturing the essence of Hercules Poirot. His actions are consistent with Christie’s portrayal of the detective and his new friend Edward Catchpool nicely fills the shoes of Poirot’s original sidekick Captain Hastings. The plot of the book is interesting and I was curious to find out what the true story behind the letters and the death of Barnabas Pandy. I enjoyed the expected scene at the end with Poirot gathering all of the suspects so he can unveil all of the deductions he made from the information he and Catchpool gathered. The solution to the crime is complex, but explained thoroughly in the final scenes. I liked the book, and hope Hannah continues to write new adventures for Poirot and Catchpool.